Your eyes are the windows to the outside world. They allow you to see the people you love and the sights that make you smile. Without them, it can be really difficult to imagine what life would be like. Interestingly enough, your eyes are also windows to what’s inside of you—and I’m not talking about the old cliché that the eyes are windows to the soul. Your eyes can tell a lot about your health. In fact, just by looking at your eyes, a doctor can catch potential health problems well before you’re aware they even exist. People tend to stay away from the eye doctor. The general thinking is that eye exams are for people looking for an eyeglass prescription or experiencing eye-related problems like vision trouble, strained eyes, eye fatigue, or more serious problems, like cataracts and glaucoma. But eye exams offer much more than that. By looking into your eyes, eye doctors can tell if you’ve got a series of other conditions of which you might not be aware. Conditions like diabetes, high blood pressure, cancer, autoimmune disorders, liver disease, high cholesterol, and others can all show through your eyes, even if you’re not displaying symptoms anywhere else. Eye doctors can notice variations and minor details in your eyes that call attention to these issues and can point you in the right direction for further health care. It might be surprising, but your eyes really are two-way windows. The problem with eye exams is that they can be rather expensive and often aren’t covered under health insurance plans. However, cheaper alternatives have been popping up and large-scale supermarket chains are even offering eye exams for about $65.00–$80.00. Typically, an eye doctor charges about $100.00–$120.00 for an exam. Although it might seem like a hefty price tag, if you think about the health benefits, it’s actually a very small price to pay. Furthermore, it’s really not something you need to do frequently. If you don’t have a family history of eye-related health conditions (cataracts, vision problems, headaches, etc. ), you only need to go once every two years. If you do have a family history of eye/vision problems, then it’s recommended you make annual visits to the eye doctor. Diabetes: Diabetes can cause blood vessels in your eyes to seep yellowish fluid and blood into the retina. This condition is called diabetic retinopathy and is the leading cause of blindness in America. Skin Cancer: An eye exam can recognize abnormal tissues that show up on the eyelid caused by skin cancer. Hypertension: Bleeding blood vessels in the eye, and bends or kinks in blood vessels that usually run straight to the retina are associated with high blood pressure. Autoimmune Disorder: Eye doctors can catch inflammation in the retina that can be a sign of lupus or autoimmune disorder. High Cholesterol: Yellow rings around the cornea can indicate high cholesterol, which can be a precursor to a number of dangerous health risks. Tumors: Droopy eyelids or different-sized pupils can be picked up in an eye exam and are sometimes associated with aneurysms and neck tumors. Liver Disease: If your eyes are slightly yellowish, or change color, it is because of increased bilirubin, a potential sign of liver disease. As you can see, a trip to the eye doctor can be very important for your overall health. 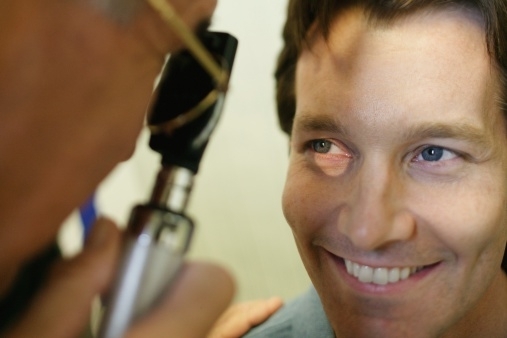 Because some symptoms of these conditions might not show up earlier or in other capacities, a trip to the eye doctor’s is a way to prevent their development and catch them before they become life-altering or even life-threatening. “What Eye Exams Can Tell You About Your Overall Health,” Huffington Post web site, April 15, 2014; http://www.huffingtonpost.ca/2014/04/15/eye-exam_n_5154529.html.